Monsoon Season | Shimlahills Offerings Pvt. 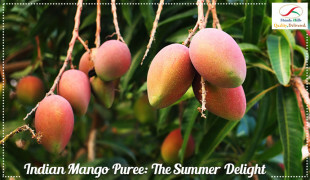 Ltd.
Summer is here, and so is the king of fruits – Mango. Among the various way to consume a mango, its puree is one of the major ingredients that goes into the making of juices, nectars, jams, fruit cheese, etc. The cloud melted into a refreshing downpour and the earth evoked a pleasant musk, signalling the start of rainy season. With every drop of rain, the soil began to breathe again… ravenously gulping water like a dying man gulps for air!